Change is the word that best describes the time and age that we live in. Everyone is on the lookout for something that adds to the quality of life. What defines change? Nothing is a better representation of the change than technology. The exciting part is that we have been on this track since ancient times. Technology that once was a trend has now become a culture. The aim is to raise the standards of living and creating things, ways and means to add ease in human life. This journey of technology started with the necessary tools. It has now taken on the course of making discoveries and innovations. Technology now works as an extension of humans. Our ever-increasing reliance on it is what gets our attention. The introduction of the computer and later the internet was a game changer. Computers reduced processing times and the internet was the medium that magnified communication channels. Together they opened doors and avenues that put us in the fast lane. We have reached a point where a universe of knowledge rests in our pocket and learning is easier than ever. 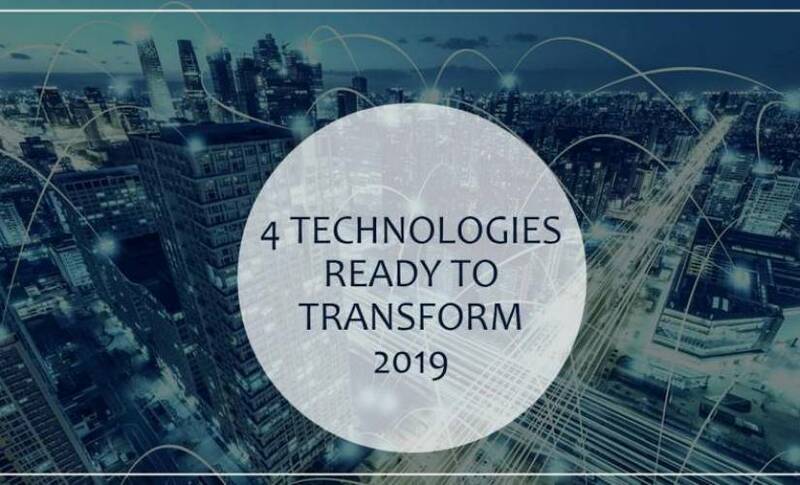 Here’s a list of technologies that are set to further transform your lives for the better in 2019. This year looks to be the year of many new changes. AI has been around for a while now. Why is it that it will transform 2019? Well, until 2018, AI was in a test phase. The previous year saw lots of technological advancements that made advances experiments possible. The increase in technical capability gave the perfect platform to proceed with testing. These tests concluded the beginning of 2019. A couple of months into 2019 and we are looking at great transformations. It seems to be the year where humans will be up against the machines. The US has been at the forefront of most of the technology but China is not very far. They have made improvements to its algorithms which has given AI a new direction. They have made improvements in business operations. It means efficient data processing, better outcomes and smarter businesses. China is all set to take the lead in AI developments and applications. These advances in AI will not only remain in business processing. They are bound to complete man fewer vehicles project, rapid improvements in robotics, and fast industrial growth. 2019 is all set to be the year for AI, Machine learning, and Deep Learning. With AI, deep learning leads to smarter, better, and improved AI. This can very well be the best of human innovations so far. You may find cybersecurity a thing of the past. Some may look at it as a contemporary reality. It has been around for a while and these comments are acceptable. Cybersecurity is as old as the connectivity itself. The connectivity called hackers along. This threat gave birth to what we now know as cybersecurity. This long history also refers to the fact there was an evolutionary process. It was not a onetime thing that refused to change. Cybersecurity grew both in scope and ability out of necessity. It is like a virus that penetrates the human body and we need medication to get rid of it. A few decades on viruses learn to resist the medicine and we look for alternatives or better cures. This is principle applies to cybersecurity as well. The only difference is that malware kept evolving because the creators were humans. Learning and attaining the capability to make a threatening virus, malware and other cyber threats. The evolution of cybersecurity has seen the development of new technologies. Some examples include hardware authentication, cloud technology, and deep learning. They can work both as individuals as well as in unison to make the shared cyberspace and devices a lot more secure. The demand for cybersecurity is rising faster than the development of new technology. The new tech explains some of the rapid increase in demand for cybersecurity professionals. Ethical hackers, chief security officer, and security engineers are few jobs that are high in demand. This technology is not just transforming the technology trends but it is also a significant influence on the global job market. IoT or the internet of things is a relatively new concept. We define it as the mutual connection of computing devices that we use in our daily lives. The exciting part is that interconnection enables them to communicate. It includes exchanging data or sending/receiving commands. In simple words, machine talking to other devices. This technology is helping save rain forest in the Amazon. Authorities have planted devices on the trees that connect to other devices in their offices. Cutting or falling of a tree sends an alert back to them and the police rush to the location to catch the culprits. The future of IoT is set to be the real thing. Progress in the technological industry enables faster and better data transmissions between devices. Transferring data has opened up new horizons. We are talking about so very much power — in your palm. We already have ACs and other home appliances that can operate via our mobile phones. IoT is set to be extensively used in transportation, surveillance applications that will help both the government and the private sector. Imagine automated warehouses managed by machines and inventory maintained by devices. IoT has seen growth trends for a few years now. McKinsey Global reports that IoT is set to generate up to $11 trillion in revenues and economic benefits. The IoT Market in 2016 was somewhere around $157 billion. It is on track to reach a staggering $457 billion by 2020. IoT is growing in 2019. We have all been through the internet Gs. There is not a need to go through the past for that. Let’s jump straight to the one that is the talk of the day. 5G. The 5G network is the latest addition to the wireless communication family. There was much talk about it and 2018 was its launch pad. 5G or the fifth generation of wireless cellular technology is a breath of fresh air. The technology is faster than fast and is set to change the technology race, forever! It uses small antennas, has smaller honeycomb cells, and it operates on high spectrum frequencies. It uses 30-300 GHz frequency range which is rarely used for public communication and provides a lot of room for speeds and consistency. Think of it as a newly built road that has little to no traffic. Smooth and swift. Everyone is on the bandwagon to be the one to launch it first but there is no clear winner for this race. Samsung, however, made a collaboration with AT&T last year. The partnership aim was to develop 5G supported equipment and network that would help AT&T internet speeds to be faster than the rest. Samsung has also become the first cellular company to launch the first 5G enabled mobile phone. Cellular networks are still working on their infrastructure improvements. 2019 is set to be the year that will provide you 20-100 times faster than 4G.